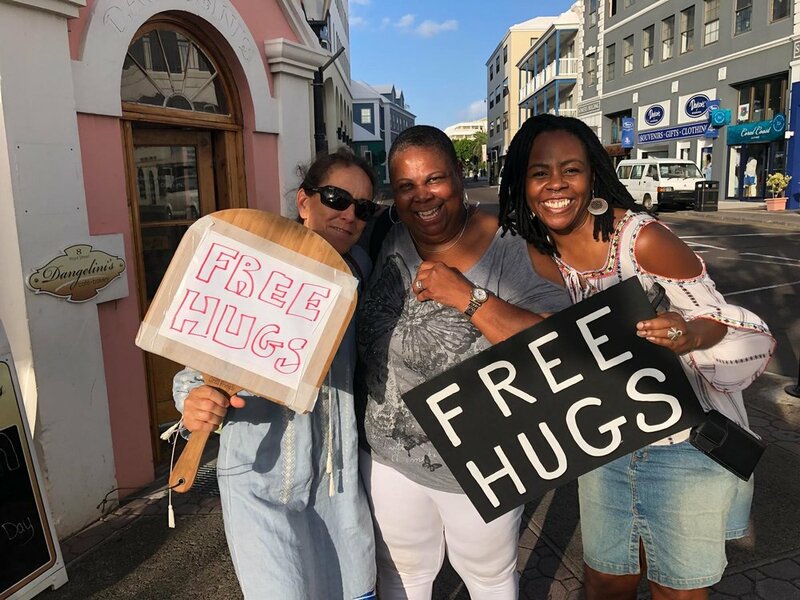 FREE HUGS BERMUDA is a community initiative to elevate kindness, goodwill and care. We greeted morning commuters with free hugs - locals and visitors happily shared hugs. Hugging is an easy way to show appreciation and acknowledgement of another person. In this age of social media disconnect and lack of human contact, it has been demonstrated that the effects of a hug can be beneficial on many levels. Science tells us that hugs stimulate the “feel good” hormones – oxytocin, dopamine and serotonin. These hormones reduce stress and anxiety and promote feelings of contentment and safety. We also received many “air hugs” from car passengers as they drove by and one hugged person shared that it was her birthday and we made her day!